This is the same palette used by Bob Ross on his television series Joy of Painting. Made of non-porous clear acrylic, the true shades of colors can be observed without the interference of a white background. 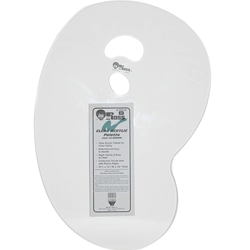 The standard kidney shape and the position of the thumb hole makes it ideal for either left- or right-handed artists. Dimensions: 16"W x 1/2"D x 24"L.